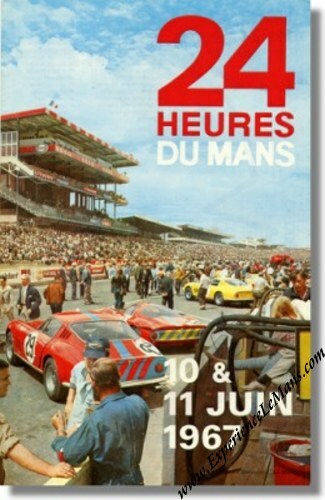 Vintage 1967 24 Heures du Mans Poster. June 10 & 11, 1967. The layout and production of this poster were in the hands of Imprimerie Oberthur who realized this poster based on a color photograph of the starting grid of the 1966 edition by Andre Delourmel from the city of Le Mans. It prominently features the # 29 Ferrari 275 GTB/C S/N 09035 of Piers Courage and Roy Pike which would be the highest finishing Ferrari in 1966 with their 8th place. The race was won by Dan Gurney & AJ Foyt in their # 1 Shelby American Ford GT MK IV (S/N J6) with a total of 388 laps to their name. This poster is in near mint condition for its age with some very minor fraying to the edges. 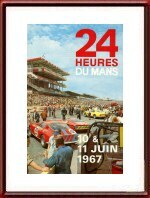 Vintage 1967 24 Hours of Le Mans Race Decal. Original car sticker for the 1967 running of the 24 Heures du Mans. This decal is made as a so-called "inside window sticker" so it is basically in mirror-script. The race was won by Dan Gurney and A.J. Foyt in their Nr 1 Shelby American Ford GT MK IV (S/N J6) with a total of 388 laps to their name.